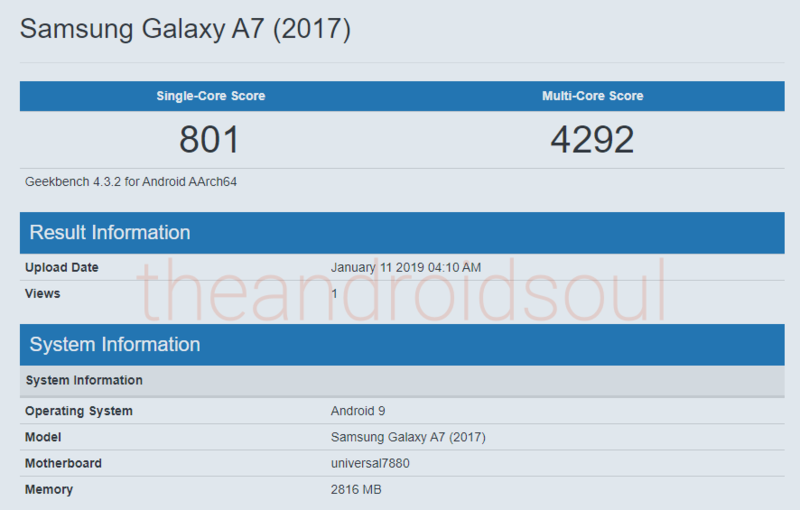 In early December 2018, Samsung Galaxy A7 2018 showed up on Geekbench running Android 9 Pie. This wasn’t a surprise of any kind since the phone is expected to get the Pie update this Q1 or in early Q2 2019. However, what is now emerging as a surprise is the appearance of the phone’s predecessor, the Galaxy A7 2017, on the same platform with Pie on board. The Galaxy A7 2017 launched with Android Marshmallow and has since received two major OS upgrades, Android Oreo the latest of them. No Samsung device has ever received three major OS upgrades, which adds even more doubt to the latest development, but hey, there is always a first time right? Even though the A7 2017 has been spotted on Geekbench running Android 9 Pie, we cannot in any way guarantee that the device will receive an official update to Pie. In fact, we have no way of determining if this listing is legit or not, but truth be told, this should get owners of this phone pretty excited.